But, as I began to clear off surfaces and sort through the plastic tubs it dawned on me. What I really needed to do was to keep things a little less ‘Christmas-y’ and a lot more ‘winter-y’. I decided to give myself the gift of more time. Because if this new approach to seasonal decorating bought me an extra month or two where I didn’t have to re-decorate a tabletop or a mantel, it could quite possibly be one of the greatest gifts ever. And, do you want to know a secret? This year, I didn’t even take the plastic bins out of the attic! I just went in there and brought a few items out a little bit at a time. It was glorious! I also gathered up several bags filled with Christmas decor I knew I would never use again and dropped it off at the Union Gospel Mission store. This new approach to seasonal decorating is particularly apparent in my dining room where my sideboard was put together in a matter of minutes. 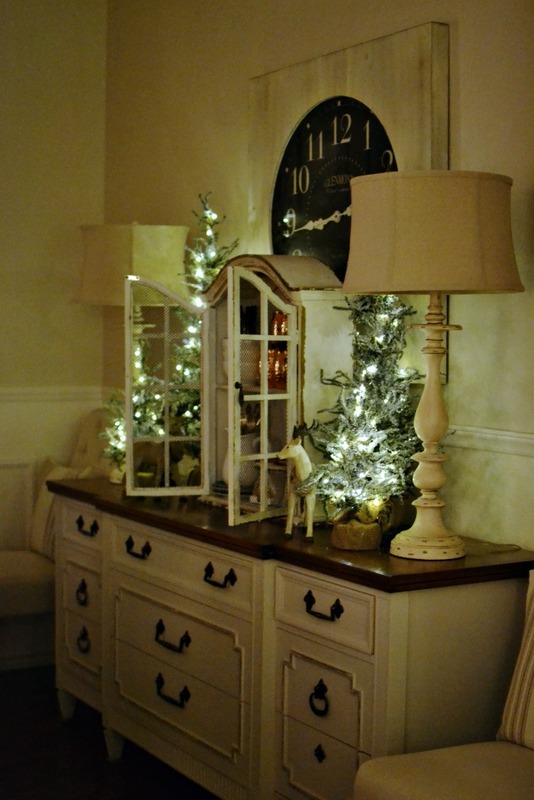 Wintery trees in varying sizes were placed next to the lamps and then my favorite little cabinet was added in and filled up with all sorts of goodies that I pulled from around the house. 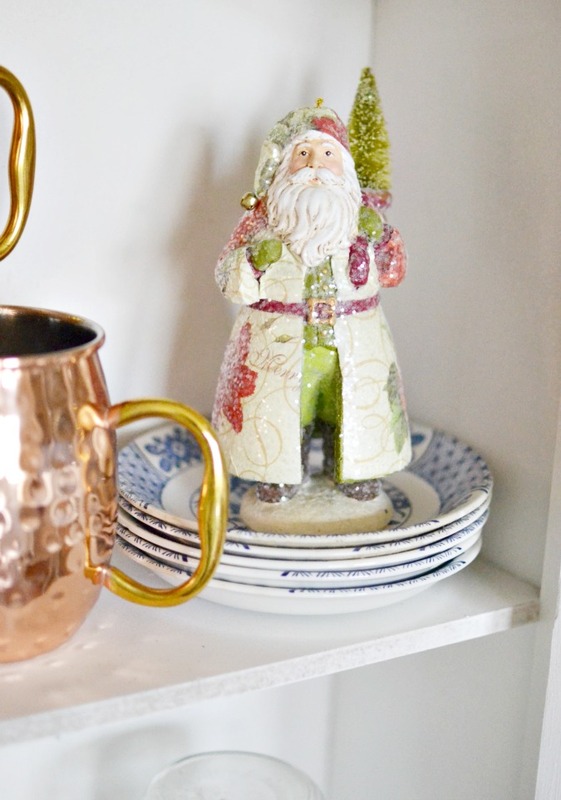 The copper mugs add such a lovely pop of warm sparkle. My only real nod to Christmas is this Santa and I think that even he will remain there long after December 25th. When I began to take this approach a few years ago, I don’t think I fully realized that, aside from being less stressful and time-consuming, it also allows me to enjoy the beauty of the season much longer. Because, the next time I will clear off surfaces and bring out new decorations will be in preparation for Spring. And that means I get to enjoy the twinkling lights, the pine-scented candles and the true beauty of this season for just a little bit longer. So, here’s my question for you, what are YOU doing this season to give yourself a bit of a break? I’d love to hear from you! 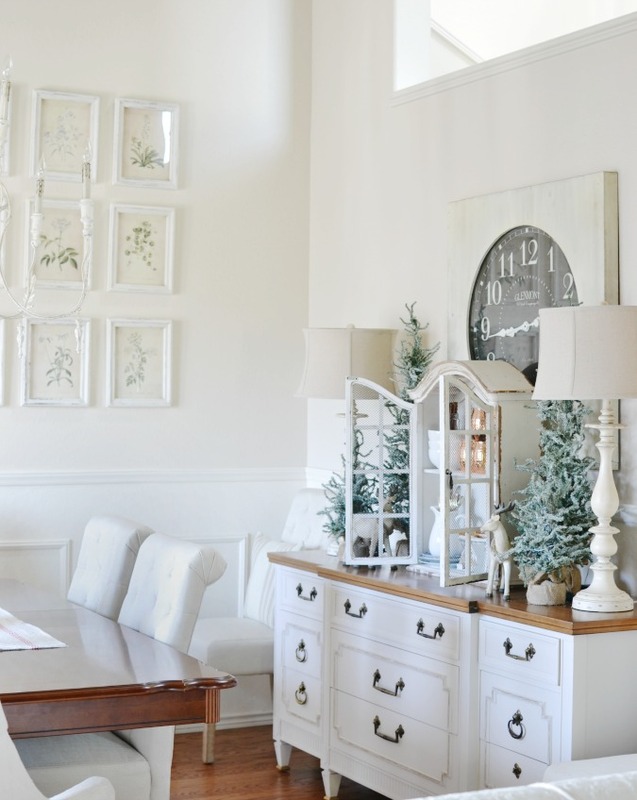 19 Comments on "Winter Decorating in the Dining Room"
Love the idea!! Love the small, unique cabinet!! Please tell me your dining room wall paint colors. Thank you! I did the same thing on my front porch. I changed just the pillows to winter and added sparkle to the flowers and DONE for winter and Christmas! I too have decided to pare down decorating. I still have special Christmasy things but no longer get out the 92 pieces of Christmas China when the 12 dinner plates & dessert plates do the job! I love this time saving idea! Oh yes, I do get the 12 WINE glasses out too! I am doing the same as you this year. Partly, it’s because the kids are grown and gone and I put up and take down myself (with the hubs help). But what I enjoy most is just a simple reminder of the season and lights. Love this idea. It’s funny I was thinking my decor looks a little tired. Maybe it’s just a tad too much! 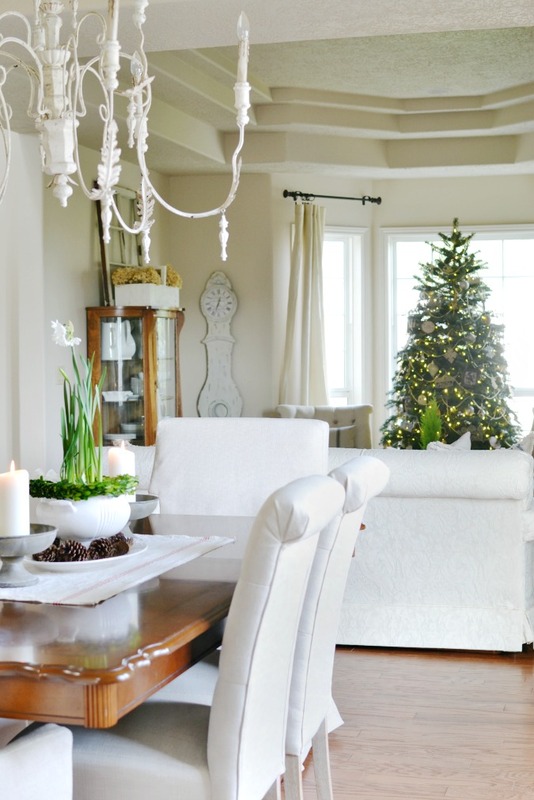 I love your idea of “less is more.” It looks lovely and clean – love all the white. There are enough Christmasy touches to recognize the season, but not overdone. 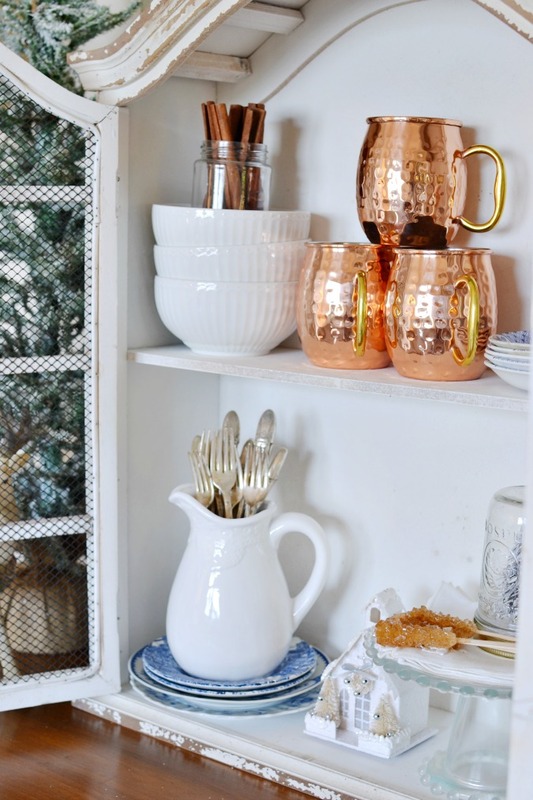 Love the shiny touches like the copper mugs and the simple cinnamon sticks. 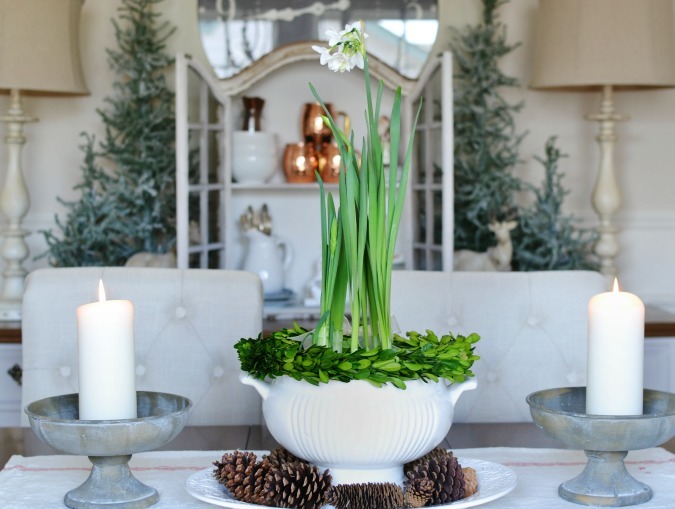 The simplicity of the dining room table arrangement is eye-catching. You’ve done a wonderful job. Very pretty and I remember that post. My theme this year is “Forest White” and pretty much my entire cottage home is wintery not so much Christmasy. Birch logs, gray (modern) sticks in white pitchers, bleached pinecones, live lil’ countertop trees, white ornaments on tree, (modern) white reindeer, and texture in white/ivory fluffy pillows, throws, and rugs. So, I’ll be keeping much of it up through mid February when I’ll slowly start bringing in spring touches. Oh I love this idea of downsizing! I just don’t have that much to pull out! Most of my decorations go on the tree and mantel. Love your little Santa! I really like your idea of winter decorating! It’s so sad when I take down all the lights on our mantels! So, like you, I have decided to leave some of the more winter decorations out till spring! I love your side bar and little Santa! Vanessa….loved your “epiphany” Your home is so beautiful!! I started out that way…trying to make it more simplistic in the Christmas decor…but as usual things got away from me…but not as much…(for me) … However, I must say that I have taken two loads of Christmas decor to our local PTA thrift store.. I love this! It is just so energy saving and logical to enjoy all the beauty for more than a month. Your neutral texture are such a soothing reprieve from the traditional hues of Christmas. Thanks for sharing your lovely inspiration with us! Dang it – I saw this on Thistlewood Farms today and wish I’d seen in a long time ago! I love how you’ve decorated for Winter . Everything is perfect. Glad I found you! Yes! I love this & have been doing the same for the past few years. My favorite snowmen, greenery, & “wintery” décor stay out til mid March~Very freeing indeed! Your buffet is really beautiful. I can relate to what you write because I also do Christmas/winter decorating that I can leave up during the coldest of Winter. (including white lights) The one thing I couldn’t do without is the nativity.